Walnut | Cupcake Villains Strike Again! The chopped up walnuts don't work too well with my frosting tips, so it got glopped on. Two things of relative import: I do believe we have reached our one year blogaversay! Yay! It has been a very very delicious year, and it is very VERY exciting to go from being excited that we hit 20 hits in a day to averaging about 100 hits every day. So, thanks! It is pretty fabulous. Thing two: Oh sweet sweet merciful weather gods, it is hot here. Hot and sticky sticky humid. Thus, no baking, and I’m slowing down posting to stretch out my current queue. These are really really handsome cupcakes. They look fancy, I know, and deep on the inside, they are even fancier. That is, these are the long-promised Heart Attack Cupcakes, which are incredibly chocolatey in 2.5 ways, and have a cream cheese frosting filling. 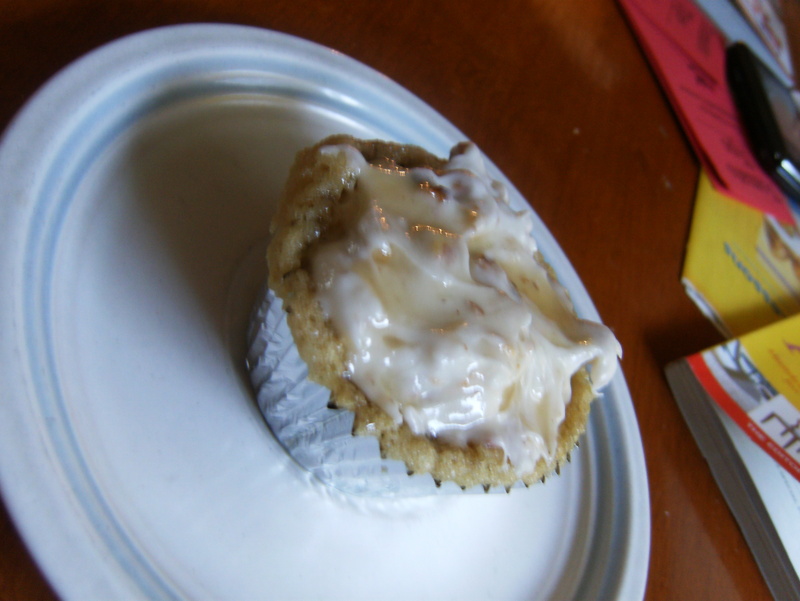 And by “have a cream cheese frosting filling,” I mean they have a fancy fancy toasted organic black walnut vegan cream cheese filling, because I am just that gosh-darn awesome. Mels and I have been talking about how we don’t feel like we’ve been experimental enough recently, which lead to brainstorming. As I’ve mentioned before, I have a number of…uncultivated resources. Wild berries, etc. Current harvests include…fresh organic walnuts. So I decided that brown sugar/walnut/maple cupcakes would be a really good idea.